Are you looking for a better way to deal with home/school communication and ensuring that everything gets to where it is going? I am sharing what works and what DIDN'T work, from experience. Read on to find the best way I have found to send things home as well as get important papers back. 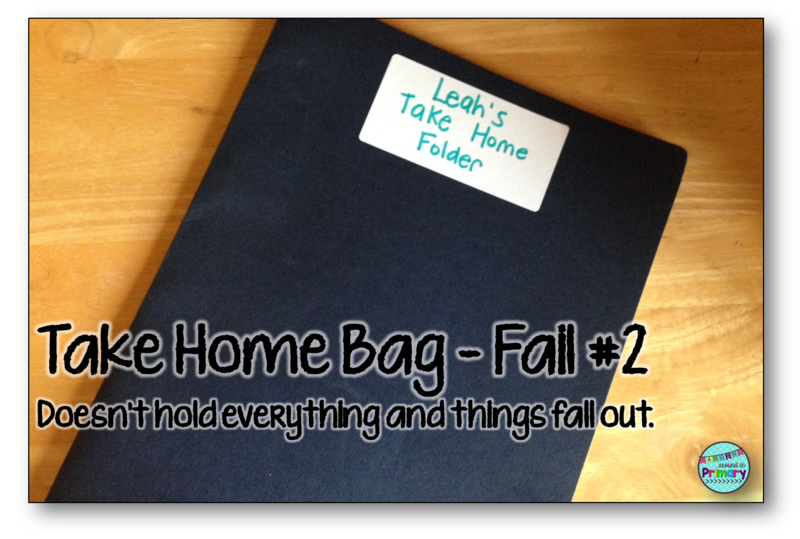 Sending things home from school and getting them back can be challenging. Many times I have received ripped, wrinkled and wet papers dug out of the bottom of a backpack or had a child dump out their backpack looking for the coins for their milk order. I have tried it all and I wanted to share my system (and my previous fails) with you. Way back at the dawn of my teaching career I used bags. I thought they were the perfect way to get everything home in one piece to a parent. I used the ones with the little zipper on top. However, it was soon very evident that these were not going to work as I had thought. The zipper thing broke off and then the bags would not close. So I moved on to Ziploc bag 2.0. 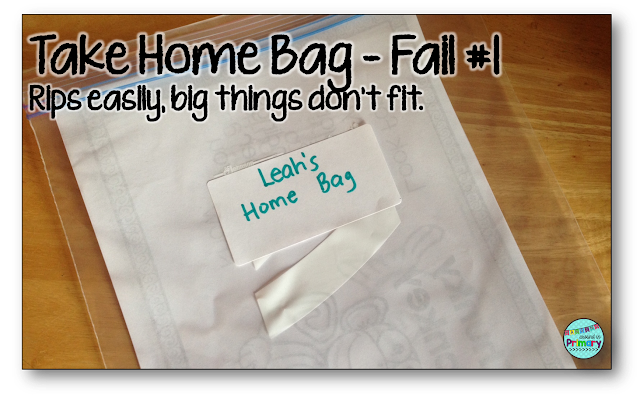 These bags were the typical Ziploc bags (minus the fancy zipper closer) and I simply labelled them with a sticker. These bags worked a little bit better but they still ripped and were never big enough to fit everything. Next, I moved on to folders like the one below. I laminated them and put everything in the pockets inside to go home. I did like these but I needed to make a new one for everyone halfway through the year as they didn't hold up very well. These worked better than the bags but I still struggled with where to put bigger things. The other ongoing issue was how to deal with money that came in. There wasn't a good place for it. So I moved on to option number 3. I found both these bags in a dollar store and instantly loved them. The mailbags are actually courier bags from Dollarama and the clear pencil cases are from Dollar Tree. The third time was a charm. THESE ARE WHAT I HAVE BEEN LOOKING FOR ALL MY TEACHING LIFE! I loved the size of the zipper bag and I loved that it closed tight. Now everything could be stored safely inside and it would stay inside. I had another a-ha moment when I saw the clear pencil cases. 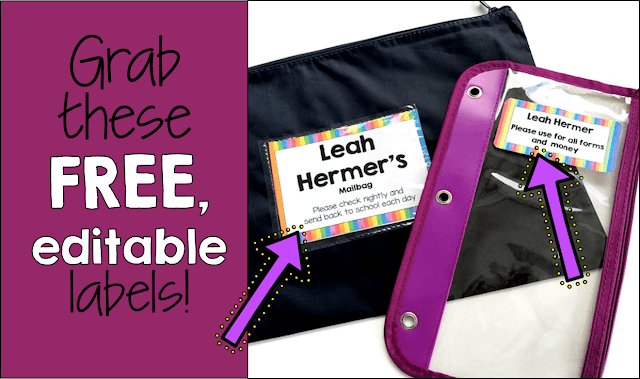 They were perfect to use for money pouches. Now I could almost guarantee that the money and the forms would get to me. I put this holder on the wall of my classroom for the pouches and the kids put them there if there was anything in them. It works like a charm. I hope you find this tip useful. I have found the investment worth it as I have never had to replace one mid-year. The money pouches are actually on their third year. Every year I buy a few more to replace those with broken zippers or ones that have not stood up to the use. You can grab labels for both the mailbag and the money bag too. They are in bright colours or in the rainbow that is shown. Add your name and email below to get access to this freebie in my Free Resource Library. 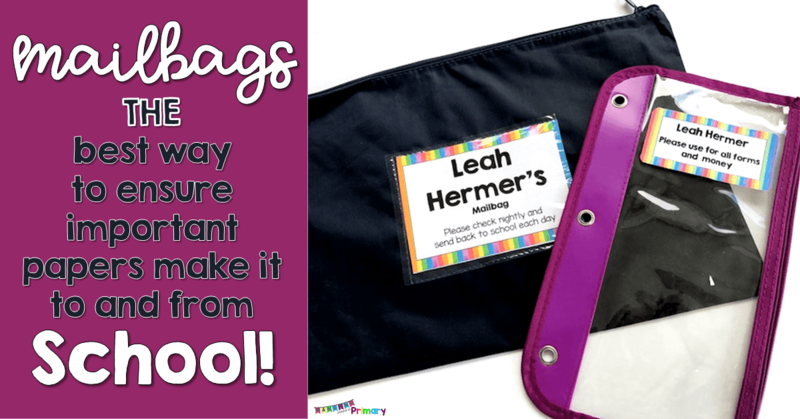 Don't forget to pin this post to come back to during BACK TO SCHOOL time. 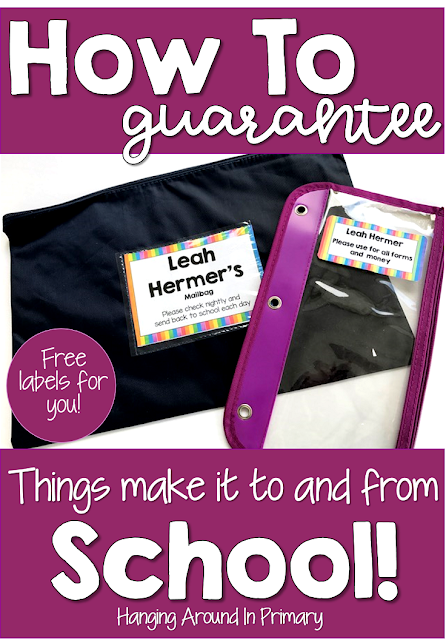 Are you looking for other ideas to get you ready for Back to School? Check out my Pinterest board for lots of ideas. Great tip, Christina! What a great way to keep things organized. It can be so hard to make sure things get home and back to school in one piece. It is a struggle, especially in Kindergarten! I am glad you found the tip useful. Thanks for hosting, Christina, and thanks for the tip! 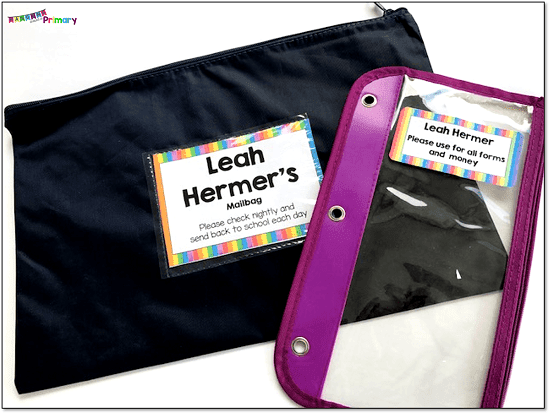 We've used the folders, but they do have to be replaced around Winter Break and they are frequently lost, so I love your idea and love that they're dollar store items even more! I LOVE the Dollar Store like most teachers. I thought the folders were the best option but I didn't like making new ones every year after Christmas. This new system really works for me. I am glad you found the idea helpful. Thanks for linking up. I love the take home bags from the dollar store! I have not seen those around here! I might have to start shopping Dollar Tree online! LOL Thanks for the tips! I found these particular bags at Dollarama (not sure if you have these in the US) but the little pencil cases are from Dollar Tree. Hope you can find them! Agreed! Don't let them open it up and rifle through it. That drives me crazy. I always tell them the things in their bag are for their families to look at. Thanks for linking up and can I say I love your name! I hope that there will be some new learning for everyone with this network. 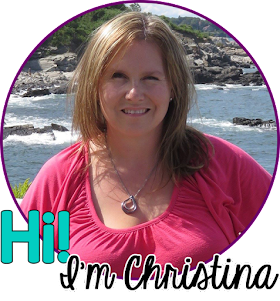 Christina--thank you for providing this opportunity for a link-up! Your tip is great. I'm looking forward to connecting with other educators/bloggers and learning more great tips! You are welcome. I hope for some great collaboration and learning within this group. 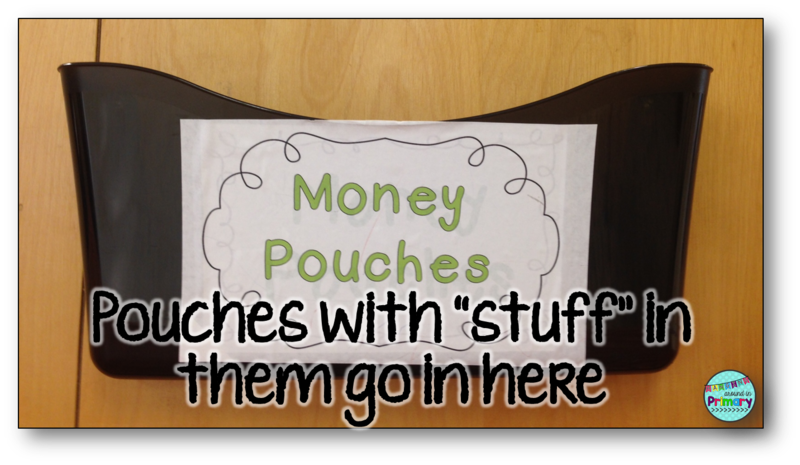 I have used them for Eye spy word work too but I do love them for money and forms. Thanks for checking out my blog! Thanks for stopping by my blog. I love my money bags. No more hunting in backpacks for loose change.